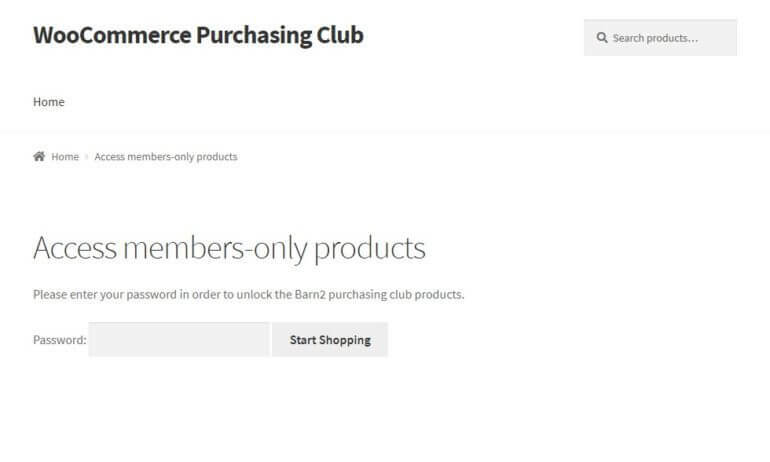 Looking for a WooCommerce purchasing club plugin to create a free or paid members-only store? In this post, we’re going to share two different plugins that you can use to create all types of purchasing clubs on WooCommerce. With these plugins, you’ll be able to make all or some of your store private and either give users access for free or require them to make a one-time or recurring payment. Choose the plugin/method that’s right for you and your store. Get set up with all the necessary WooCommerce purchasing club features at your store. What types of WooCommerce store can benefit from a purchasing club? Purchasing clubs have plenty of use cases that go beyond your stereotypical “wine of the month” club (though they’re certainly great for that as well!). Wholesale stores – you can create a special area for wholesale members while keeping your regular store for retail customers. This is great for wholesale buying clubs running on WooCommerce. Membership sites – if you run a membership site, you might want to create special products that only your members can purchase. Special discounts – you might want to offer a special set of discounted prices for members to create a discount shopping club. Employee/staff purchasing – if you sell special products to your employees (like uniforms), you want to keep that area private. Marketing efforts – a purchasing club adds scarcity, which can aid your marketing efforts. For example, you can give users who register with an email address access to special products/prices as an incentive to help build your list. As the saying goes, there is more than one way to skin a cat. No, I don’t know who was running around skinning cats in the 1800s, but the core meaning holds true when it comes to creating a WooCommerce purchasing club. That is – you have options. And these options depend on the type of WooCommerce purchasing club that you want to create. Only members can shop at the store – anonymous visitors can’t purchase anything. This is a true private shopping club. Members can view unique products that are members-only, but anonymous visitors can purchase the rest of the products. This is kind of a hybrid. Members and anonymous visitors have access to the exact same products, but members get a special discount. This is more of a discount shopping club. Then, you have the whole other decision of whether members need to pay for access or can register for free. WooCommerce Protected Categories – this method is more flexible and lets you choose between free/paid memberships and whether or not to make all of your products members-only. Skip to tutorial. WooCommerce Private Store – this method is simpler but not quite as flexible. It makes your entire store private, which will only fit certain types of purchasing clubs. Skip to tutorial. Ok, so now that you know what your options are – how do you pick the approach that’s right for you? Require members to pay a one-time or recurring subscription. Recurring revenue is a great way to monetize any club membership because it ensures you always have revenue coming in no matter how many products your customers actually buy. Make some products public and some private. If you want to display different products based on which type of user is shopping, this is the method you want. Create multiple levels of memberships. This lets you show different products to different types of members. Make all of your products members-only. You can also just make everything private, if needed. Essentially, WooCommerce Protected Categories can help you create all three types of private purchasing clubs that I listed above. Create a 100% private purchasing club. With this method, only members will be able to purchase products – anonymous visitors won’t see anything. Make your club free to registered members or require payment. Because the entire store is private, this is good if you’re offering free access or running a members-only store where users make their payment offline and then get digital access (e.g. a local purchasing club). You can also use a plugin like Gravity Forms to require users to pay to register. Essentially, WooCommerce Private Store can help you create the first type of private purchasing club (where only members can shop). Beyond the differences discussed above, WooCommerce Private Store is also a little simpler to setup, though both plugins can be configured fairly quickly. Now that you have a better idea of which plugin is best for your specific needs, you can jump to a specific tutorial by clicking below. Choose whether or not to require users to pay a subscription for access to your private products. Again, this subscription approach is great because it ensures you always have recurring cash flow coming into your business. Make all your products part of the purchasing club or still leave some products available for guest users. You can also just offer different prices on the same products for members of your purchasing club. Create multiple levels of membership, where different users have access to different products. 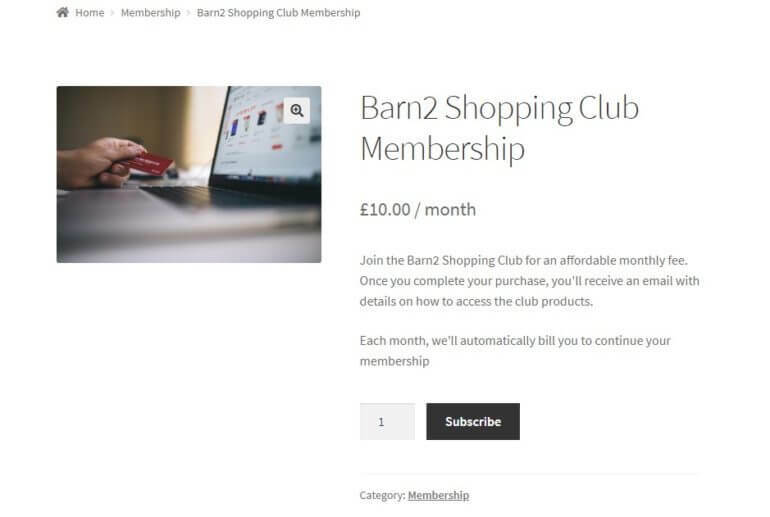 WooCommerce Protected Categories can help you create a free members-only purchasing club all by itself, but if you want to accept recurring subscriptions, you’ll need the paid WooCommerce Subscriptions plugin. If you’re planning to make your purchasing club free, you can safely skip to the next step. But if you want to accept paid subscriptions to get the aforementioned benefit of stable, recurring revenue at your store, here’s a high-level look at how you can use the WooCommerce subscriptions plugin. If you want to accept recurring subscriptions, you’ll use the WooCommerce Subscriptions plugin to create a “subscription product” that’s public. Visitors can then purchase this product and, once they purchase it, unlock all of the other hidden purchasing club products. All you need to do is use the plugin to grant access to the hidden products to the Subscriber role that WooCommerce Subscriptions uses. If users ever stop paying their subscription, the WooCommerce Subscriptions plugin will change their user role (and thus remove their access to your purchasing club). You can also give users a password if you’d rather not rely on user roles. If you want to accept one-time payments, you can create a regular public WooCommerce product that gives users access to the store’s password. Do you want to hide all of your products or just specific categories of products? Do you want to hide your products with a password or by WordPress user role? Or both? Hide all products or just some products? WooCommerce Protected Categories automatically hides any subcategories of a hidden category, as well as all the products inside the category/subcategories. Hide all of your categories, you can create one “Purchasing Club” parent category and put all your products inside. Leave some products publicly available, you can leave most of your products in public categories and just make specific categories private with the plugin. You can also use the latter approach to create discounts for purchasing club members by creating a private category with discounted versions of your products. Tip: Using the free Duplicate Post plugin lets you quickly duplicate the products that you want to discount. You then just need to change the price in the hidden category. Use password protection or user role privacy? Password Protected – users need to enter a password to view the hidden category (and all the products/subcategories contained inside). This gives you a lot of flexibility for granting access because it’s not tied to user accounts. User Role Protected – only logged in users with certain user roles can see the hidden category (and all the products/subcategories contained inside). This is most helpful for subscription purchasing clubs because you can automatically grant access to the Subscriber user role that the WooCommerce Subscriptions plugin utilizes for active subscribers. Or, you could grant access to any registered user or a custom user role created with the free User Role Editor plugin. You can use either approach to restrict your private purchasing club to members only. And if you want to create different membership levels with access to different products, then you can do this too. With the password protection option, just create different passwords for different categories. Or with the role protection option, restrict different categories to different user roles. Easy! Even with different membership levels, you can still use a single login page – users will be automatically redirected to the relevant category based on the specific password that they enter. 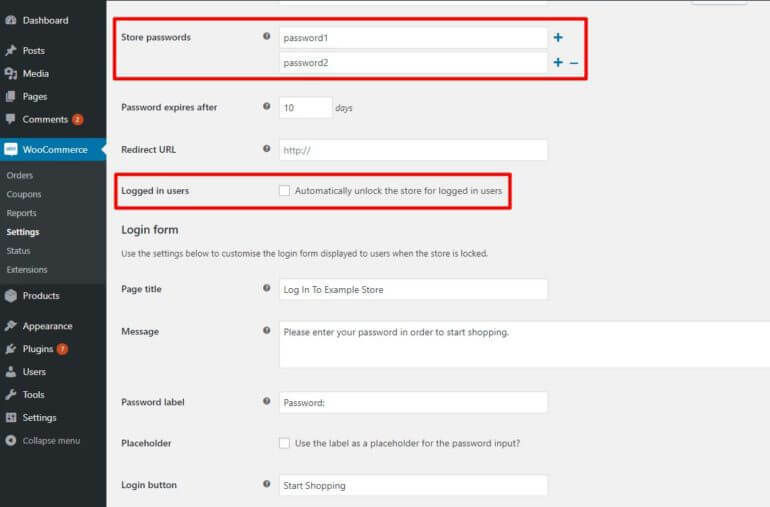 If you’re selling a membership product, you can automatically send the password by using the Follow Ups plugin to automatically send purchasers an email. If you’re using private role protected categories, WordPress will automatically send new users their login details. You should also add navigation menu links to make it easier for shoppers to find the purchasing club products. Use the Peter’s Login Redirect plugin to automatically send users to the private purchasing club category after they log in. Use the Follow Ups plugin to send them an email with instructions on how to access their private club products. Allow members to register for free, only register members who have made an offline payment, or require payment. The plugin is very simple to configure, which is one of the reasons it’s a great option if your purchasing club won’t be affected by its limitations in comparison to the previous method. Once you install and activate the plugin, go to WooCommerce → Settings → Private Store to configure the plugin. Create one or more passwords that give access to your store without the need for a WordPress user account. You can also combine the two approaches if you want a way to give certain types of users access without creating an account for them. If you’re going to give any users the password, you can configure the plugin’s login form in the Login form section. And you can also create a redirect URL to take users to a certain page after logging in. If you’re exclusively going with the password protected approach, you’re pretty much done now! If you want to require users to create a user account rather than just entering a password, you’ll want to create a more branded login/register page for WordPress accounts. Theme My Login – lets you customize the core WordPress login/register pages’ appearances. Also includes a helpful option that lets you hold new registrants for admin approval before they can access the purchasing club products. Gravity Forms – though this is a premium add-on, the User Registration Add-on gives you a lot of flexibility for handling new user registrations. It also lets you create a completely custom registration/login page (that is, you don’t need to use the core WordPress pages). You can also require a payment via PayPal if you want to charge for membership. There you have it! 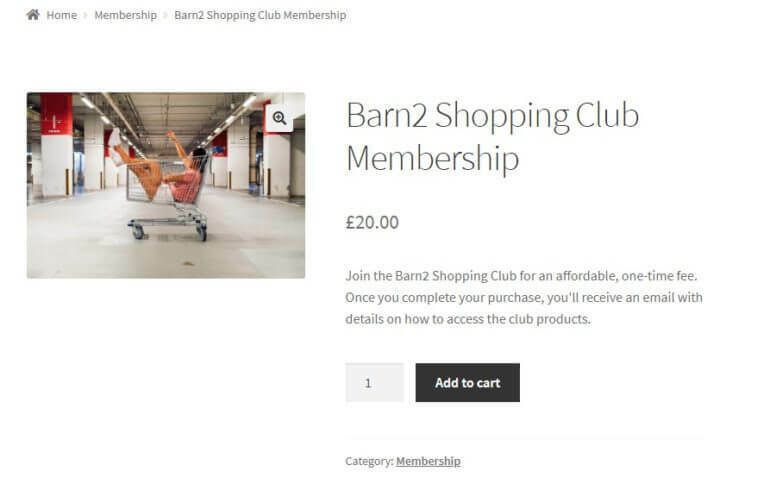 Two different ways to create a members-only purchasing club at your WooCommerce store. For most purchasing clubs, WooCommerce Protected Categories is the best option because it offers more flexibility. But if you just want to make your entire store private to create a 100% private shopping club, WooCommerce Private Store offers a simpler, but more limited, option. Do you have any other questions about how to create a WooCommerce purchasing club using either of these plugins? Leave a comment and we’ll do our best to help out!